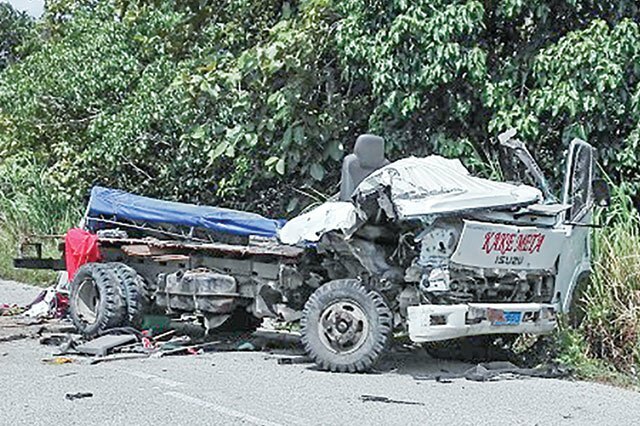 TWENTY people were injured after two trucks collided on the Hiritano Highway in Central last Friday night. Later, another public motor vehicle travelling from Gulf to Central went off the road after the driver tried to evade the debris on the road from the first accident. It is believed that seven people were injured in the second accident. National Capital District police chief superintendent Sylvester Kalaut could not be reached for comment last night to confirm the figures and provide more details. But according to an EMTV footage, one of the trucks involved in the first accident was a PMV believed to be travelling from Central to Gulf. The other was a semi-trailer travelling to Central. Witnesses said both vehicles collided near a bend. “There were women and children on board, and they were trying to go around a hill, but they hit each other,” one witness told EMTV. The accident happened at 11pm.